Authorities Thursday are seeking help in locating a man who drove through a police barricade and led officers on a chase down multiple San Diego freeways last Saturday. 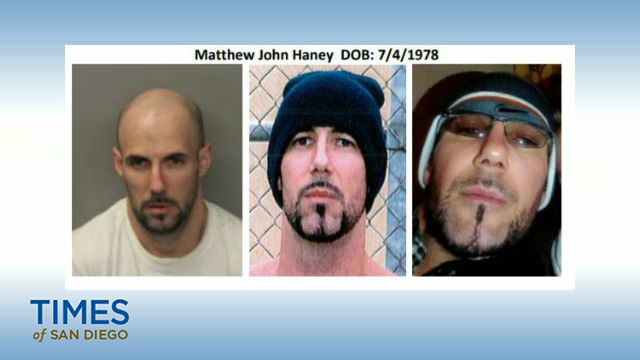 Matthew Haney, 40, is wanted for assault with a deadly weapon and felony evading following a series of events that began just before 10:30 p.m. July 14, San Diego police Officer Mark Herring said. Haney allegedly drove a black Honda Odyssey minivan through a barricade at the intersection of Sixth Avenue and El Prado in the Balboa Park area, Herring said. Haney then allegedly drove directly toward a traffic controller before continuing northbound onto Sixth Avenue, Herring said. ”The traffic controller had to run away from the vehicle and was within a few feet of Haney striking him,” Herring said. Haney allegedly struck a parked car with a 29-year-old pregnant woman inside on Washington Street near Fifth Avenue before leading officers on a chase through San Diego, Lemon Grove and La Mesa. The minivan crashed into a San Diego Police Department K-9 Unit vehicle in the parking lot of the La Mesa Arts Academy on Parks Avenue. Haney allegedly exited the minivan and ran away from officers, Herring said. He is described as a 40-year-old white man around 6 feet tall and 160 pounds with blond hair and brown eyes. Anyone with information on the location of the suspect is asked to call the SDPD Western Division at (619) 692-4834 or the San Diego Crime Stoppers at (888) 580-8477. Tipsters may remain anonymous and could be eligible for a reward of up to $1,000.